In the third installment of the Cainsville series, Kelley Armstrong’s Deceptions brings readers on a roller-coaster of emotions and shocking discoveries. Learning more about her and her family’s connection to Cainsville and the world of the Fae, Olivia seeks the truth through her visions of a long lost past; however, there are more dangers than ever before creeping in her path. With visions endangering Olivia’s state of mind, a love triangle that’s attached to an ancient past life, and an extremely upset ex fiancé in the mix, readers won’t be able to put down this fast paced novel. Will Olivia finally unlock the mysteries of Cainsville? Will she learn the truth about the Larsen’s? Olivia’s life has exploded. She’s discovered she’s not only adopted, but her real parents are convicted serial killers. Fleeing the media frenzy, she took refuge in the oddly secluded town of Cainsville. She has since solved the town’s mysteries and finds herself not only the target of its secretive elders, but also her stalker ex-fiancé. Three books down, two more to go! After thoroughly enjoying both Omens and Visions, I was pretty eager to begin Deceptions. I heard some mix reviews about the third installment of the Cainsville series, but I went in open-minded. Deceptions was a pretty well-done book, adding depth and clarity to the Cainsville series storyline. Growing increasingly more eerie than its predecessors, Armstrong’s paranormal thriller definitely had me jumping at noises I’d heard in the night…completely and utterly nervous about things living in the shadows of my room…shouldn’t have read this at night. Let’s dive into this review. The story continues with Olivia trying to solve the mysteries behind the serial killings that her parents are alleged of committing. Unfortunately, this isn’t the only issue she’s forced to face. James, her ex-fiancé, is a more prominent role as he tries to woo her back…even if it causes her harm. Additionally, her visions are occurring much more frequently and taking a larger toll on her health. There are definitely a number of obstacles in Olivia’s path in Deceptions. The great thing about Deceptions is that the story draws back to the murders. Furthermore, the amount of knowledge we gain is intense. Olivia finally starts to piece together the reasons her and Gabriel are so important to the Fae Folk, what Ricky has to do with all of this, and the reasons behind the killings the Larsen’s were convicted for. All this information alone made this book such a treat to read. There’s definitely a little more drama added into the mix…love triangle. This part’s probably why this book turned me off a bit, especially since (without spoiling too much) it’s a central part of the story. The paranormal/supernatural elements tied in with the dynamic detective duo of Olivia and Gabriel in Omens are what drew me into this series originally; the addition of a love story and a love triangle kind of disappoint me, especially with them being a larger part of the plot. Fruit for thought for those who are iffy on those things such as I am. Olivia, Gabriel, and Ricky all continue to develop tremendously; the best part is we get more chapters from the perspective of Gabriel and Ricky. Armstrong maintaining the point of view mainly on Olivia yet switching infrequently to Gabriel and Ricky is absolutely brilliant. Why? Because we finally get to understand more as to why Gabriel puts such distance towards others and how Ricky feels learning so much regarding Olivia and the Fae. Even better, this alternating narrative shows the concept of the unreliable narrator, which definitely adds juice to the story. Basically, we see what Olivia thinks of the situations. What we tend to forget is that we are getting her thoughts on what Gabriel thinks of her…but is that the truth? The answer is no, folks. Readers will begin to see that Olivia’s observations of Gabriel and Gabriel’s observations of Olivia tend to be dramatically different from what they are actually thinking about one another…ultimate character development. We see SO much more than they do, which I love as a reader. There are definitely more characters added into the story, such as more to do with the Fae, and almost all the previous characters returning to the story yet with added importance to the plot. The more Olivia learns, the more progress occurs with the characters, such as the inhabitants of Cainsville. It’s a neat way to create both story progression and character development. There’s nothing really new on this front; the language is still easy to follow and fairly descriptive in nature. Armstrong continues to paint the story before our eyes, which sometimes is a little scary since we are dealing with some freaky supernatural stuff. 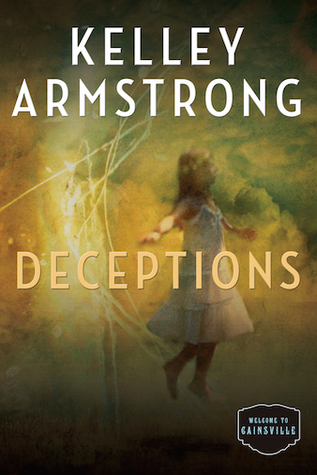 Deceptions definitely brought more to the Cainsville series; not only does Armstrong provide insight into the Fae Folk and the serial killings, but she also expands on the characters. The discovering that a large part of the plot revolves around a love triangle was definitely a disappointment; however, I still was able to enjoy this thrilling and dark novel. I still strongly recommend this series to anyone who loves adult paranormal/supernatural books, even more so if you enjoy some romance in the mix. Are you reading Armstrong’s Cainsville series? I have never read Kelley Armstrong. Buy after reading your review, her books sound like something I would enjoy. I’ve had her books in my tbr on goodreads for sooo long. I think I’ll go out and by one now (: Love your review!